Remarks: Gibson Collection - Prayer book. See also: Correspondence at UVM's Center for Digital Initiatives. Joyce, Charles H., of Rutland, son of Charles and Martha E. (Grist) Joyce, was born in Wherwell, England, Jan. 30, 1830. He came to this country with his parents in 1836, and settled in Waitsfield. He worked on a farm and attended the district school, winters, until he was eighteen years old, when he left the farm and completed his education at the Waitsfield and Northfield Academies and at Newbury Seminary. He was a page in the Vermont House of Representatives three sessions, assistant librarian one year, and librarian one year. He taught school several terms, at the same time pursuing his legal studies under Hon. 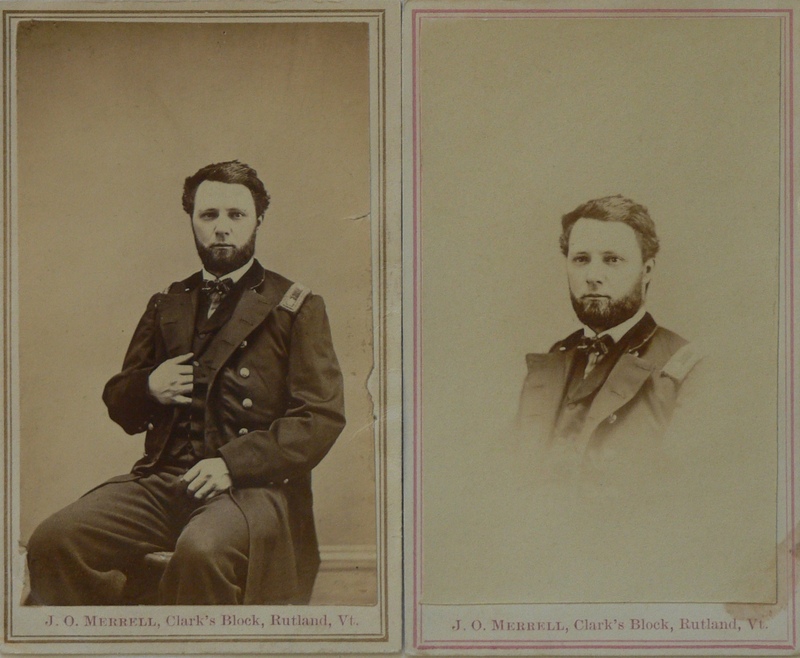 F. F. Merrill of Montpelier, and the late Col. F. V. Randall of Northfield. He was admitted to the bar of Washington county at the September term, 1852, and commenced the practice of law at Northfield in December, 1855. In September, 1856, he was elected state's attorney of Washington county, and re-elected in 1857. During the last year of service as state's attorney he greatly distinguished himself in the prosecution and conviction of one Ariel Martin, for the murder of two men in Calais. Hon. James Barrett presided at the trial and Martin was defended by Paul Dillingham and Luther L. Durant. In June, 1861, he was appointed by Gov. Erastus Fairbanks major of the 2nd Regt. Vt. Vols. Infantry, the first three years' regiment to leave the state, and in June following he was promoted by Governor Holbrook to lieutenant-colonel in the same regiment. He fought gallantly with his regiment in the first battle of Bull Run; at Lees Mills; at Williamsburgh; at Golden's Farm; at Savage Station; at White Oak Swamp; at the second Bull Run; and at Fredericksburg. In several of these battles he was specially mentioned by his superior officers for gallant conduct upon the field. In January, 1863, he was compelled to resign his commission on account of a severe disability contracted during the campaign of 1861. On his retirement from the army Colonel Joyce removed to Rutland and resumed the practice of his profession. At the March term, 1869, of the Rutland county court, the case of State against Ziba, Fred and Horace Plumley for the murder of one John Gilman was tried; Colonel Joyce had charge of the defence, and his argument for the respondents attracted wide attention and placed him at once in the front rank of jury advocates in this state. In 1874 he was engaged to assist the state's attorney in the prosecution of John P. Fair for the murder of one Anne Frieze at Rutland under the most horrible circumstances. The case attracted wide attention and it was said by the daily press of the day that Colonel Joyce's closing argument was a masterly effort and highly appreciated by the bar and the vast audience present at the trial. But probably the greatest effort ever made by him and the most splendid victory he ever achieved at the bar, was in the celebrated case of Calvin S. Inman of Poultney, tried for the shooting of Patrick Sennott, at the September term of Rutland county court, 1889, and acquitted. The colonel made the closing argument for the defence and during its delivery the large court room was packed with people from all parts of the county. A death-like stillness was preserved by the vast audience until he closed, when the deep murmur of applause showed the effect produced by the fiery and eloquent words of the advocate. The Rutland Daily Herald, speaking of the argument said: "Colonel Joyce was eloquent and impressive. It was the effort of his life. He was inspiring; he was pathetic; and with the magical witchery of a silver tongue he painted a portrait so touching, so saddening that at times there was scarcely a dry eye in the audience. Again in characterizing the affray, and that which led up to it, he gave full reign to his terrible power of denunciation." In 1869 he was elected a member of the state House of Representatives from the town of Rutland, and in 1870 was again elected for two years, during which time he was speaker of the House. In 1874 he was elected to Congress from the first congressional district, and re-elected in 1876, 1878 and 1880. Colonel Joyce took an active part during his eight years service in the national House of Representatives, in the discussion of most of the important questions which came before Congress. In 1876 he made speeches on the death of Vice-President Wilson; on the presentation of the statue of Ethan Allen; on early resumption of specific payments; on the centennial celebration of the American independence; in 1878 on the repeal of the resumption act and the remonetization of silver; on the election of President and Vice-President; on the tariff; on an amendment to the Mexican war pension bill, to exclude rebels from the pension roll; in 1879, on the policy of the Democrats in forcing an extra session of Congress by failing to pass the regular appropriation bills; in 1880, on commercial reciprocity between this country and Canada; on the alcoholic liquor tariff; and in 1882, on Chinese immigration; on the apportionment of representatives to the national Congress; and on the policy of the government in relation to pensions. Many of these speeches attracted the attention not only of the people of Vermont, but of the whole country and were widely circulated. In politics Colonel Joyce has always been an earnest, thorough-going Republican, and has in every presidential campaign since 1852 done effective work upon the stump for his party, not only in Vermont, but in New Hampshire, Connecticut, Indiana and New York. He has long been ranked among the leading platform orators in the country; a fine voice, an earnest, impressive manner, a thorough knowledge of his subject, and a firm conviction of the truth of what he utters, are among the elements which make him one of the most eloquent and effective speakers before a popular audience in this country. During all the years of his busy and laborious life, in his profession and in Congress, he has found time to respond to all the numerous calls made upon him for the 4th of July orations, addresses at agricultural fairs, Memorial Day addresses, and lectures upon a great variety of subjects. He has always been a close and thorough student and a keen and interested observer of men and things. His favorite books outside of the law, are the Bible, Shakespeare, Milton, Bunyan's Pilgrim's Progress, Scott's works and Dickens' while history, biography, political economy and general literature make up the catalogue. The esteem in which Colonel Joyce has always been held by the people of his adopted state is fully shown by the positions of trust and honor to which they have so often called him. 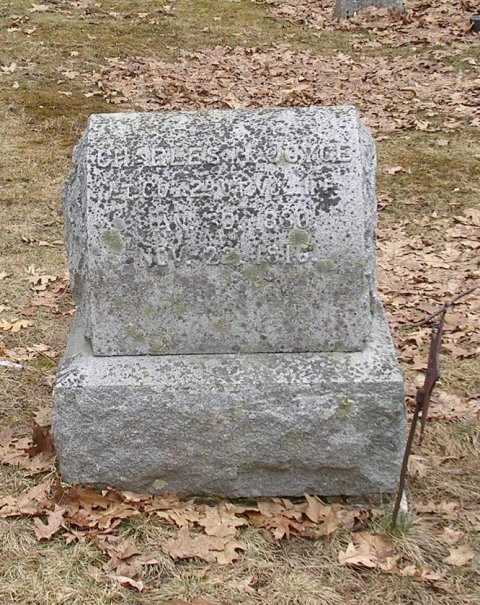 He was married, Feb. 21, 1853, to Rouene Morris, daughter of Gurdon and Laura (Scott) Randall, of Northfield. Of this union there are now living one son and one daughter. The son, Charles Pitt F., graduated at Princeton in 1887 and at Dartmouth Medical College in 1892. The daughter, Inez Rouene (educated at Tilden Seminary, Lebanon, N. H., and Temple Grove, Saratoga, N. Y. ), was married, March, 1877, at Washington, D. C., to Theron C. Crawford of Michigan. Source: Jacob G. Ullery, compiler, Men of Vermont: An Illustrated Biographical History of Vermonters and Sons of Vermont, (Transcript Publishing Company, Brattleboro, VT, 1894), Part II, p. 228. The present Member of Congress from the First District of Vermont, came to Northfield in 1850, and commenced reading law at the Center, with John L. Buck, Esq. ; read with him one year; then with F. V. Randall, Esq., at Northfield Falls, one year ;' then with F. F. Merrill, Esq., at Montpelier, one year, when he was admitted to the bar of Washington County, at the September term, 1852. In 1853 Mr. Joyce entered into co-partnership in the practice of law at Northfield with C. N. Carpenter, Esq., and subsequently with F. V. Randall. In 1853 he was appointed State Librarian. 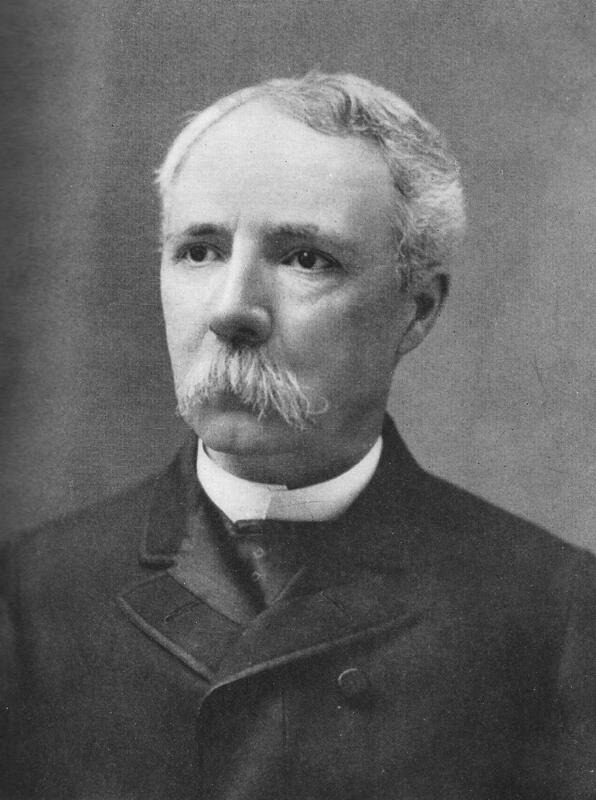 In December, 1855, he opened a law office in Northfield. In 1856 he was elected State's Attorney, and was re-elected to the same office in 1857. As soon as Mr. Joyce was elected State's Attorney his practice of law began to increase, so that in March, 1861, he had a fine docket, and did a good business. When President Lincoln issued his call for seventy-five thousand mane he was at Montpelier, attending a term of court. He immediately returned home to Northfield, and with the aid of some others raised a company of men which they tried to get into the 1st Regiment, commanded by General Phelps. He did not succeed in this, but Governor Fairbanks tendered him the post of Major in the 2d Regiment, which he accepted, and on the 7th of June, 1862, he was promoted to the rank of Lieutenant-Colonel of his regiment. He remained in the service until January, 1863, when he was compelled to resign his position, on account of poor health. After returning from the army, and partially recovering his health, he located in Rutland, resuming the practice of law in company with C.C. Dewey, Esq. The partnership continued until the spring of 1866, when it was dissolved, and he carried on business on his own account. In 1869 he was elected to the House of Representatives from Rutland - and again in 1870 - 71. The last two he was elected Speaker, conducting that responsible office in a manner that pleased all parties, and made him decidedly popular. Mr. Joyce took a lively interest in the campaign of 1868, stumping his own State, and making many speeches both in New York and New Hampshire. In 1874 he was elected to the Forty-fourth Congress, and re-elected in 1876 and also 1878. 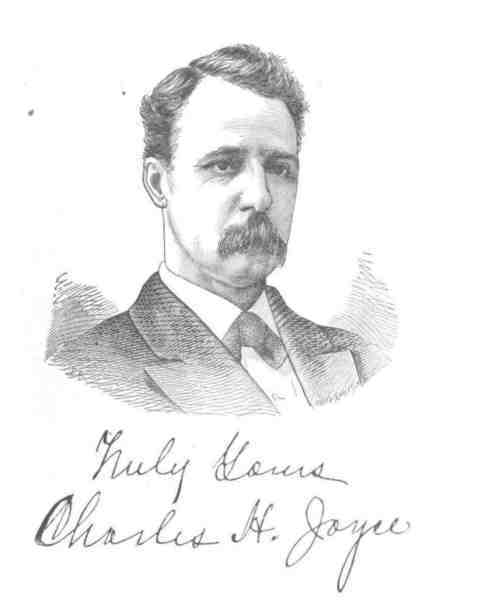 In the campaign of 1876 he made speeches in Vermont, New Hampshire, New York, Connecticut and Indiana, for Hayes and Wheeler. Mr. Joyce, during the time he has been [in] Congress, has made the following speeches: In the Forty-fourth Congress me made the first eulogy on the death of Henry Wilson; speech on the currency, in favor of honest money; a speech on the presentation of the statue of Ethan Allen, to be placed in Memorial Hall in the National Capital; next a speech on the Centennial Exposition to be held at Philadelphia in 1876; also a speech in confirmation of certain land claims in the Territory of New Mexico; also a speech on the counting of the electoral vote of Louisiana; also one on counting the electoral vote of Vermont. In the Forty-fifth Congress Mr. Joyce made the following speeches: One on the contested election case of Patterson against Belford from Colorado; one in the contested election case of Acklen against Darrell, of Louisiana; a speech on the "Resumption act, and the remonetization of silver"; a speech on a proposed amendment to the Constitution of the United States, relating to the election of President and Vice-President, and also relating to the Civil Service of the government; a speech on the Mexican Pension Bill, against restoring to the pension-roll the names of those which had been stricken off for participation in the rebellion; also a speech on the Tariff. In addition to this, we have cut down the forests, and opened up the prairies; we have lightened the burdens of the toiling, struggling millions, and filled up the world with our inventions. We have built school-houses in every valley and upon every hill-side; we have erected churches in every village; we have touched the banks of creek and river with the magic wand of our mighty progress, and behold villages and cities have once sprung up, filled with a brave, intelligent and industrious people, and echoing the rattle of machinery and the hum of honest industry. Amid the fiery flames of civil war we have cemented anew the bond of our Federal Union with untold treasures and the blood of a million brave men; we have broken down the red Moloch of war between nations and erected upon its ruins the throne of justice and the golden scepter of peaceful arbitration; we have tunneled the Ocean wires, annihilated space and time, and filled the world with wonder and knowledge; we have ascended on high, plucked lightning from the clouds, chained it to the chariot wheels of our progress, and made it the servant of genius and science; we have dived into the bowels of the earth, unlocked the secrets of nature, and compelled them to minister to our comfort, our knowledge, our progress ' we have crystalized [sic] the great principles of liberty, justice and equality, and burned them into the organic law of the Republic; we possess the only free government in the world, and enjoy more real happiness than any other nation on earth. Such is the history of our country under the benignant influence of a protective tariff. We stand to-day "upon the dividing line between the centuries, looking back through one hundred years, with all the grand achievements, and forward to the illimitable future, with all its magnificent possibilities." Mr. Joyce married Rowena M. Randall, and they had three children: Ines R., b 1854 ' Grace R., b 1864 ' Charlie R., b 1868. John Gregory, Northfield's First Century: Centennial Proceedings and Historical Incidents Of the Early Settlers of Northfield, VT., with Biographical Sketches of Prominent Businessmen Who have been and are now residents of the town, (Argus and Patriot Book and Job Printing House, Montpelier, Vt., 1878), p. 219.